The "Smart Home" is a cool vision -- You can automate your house by connecting your lights and appliances and locks and sensors and other devices together, control them remotely, and even access them over the Internet. So you can turn on the lights automatically as you approach the house, or fire up the slow cooker when you are finally ready to head home. But all this can be a significant investment in time and money, even to get started with a few devices. You also need to choose and set up the infrastructure to connect them together. And, with the recent news about hacking large numbers of embedded devices that are part of this Internet of Things (IoT), you also need to be careful about security, including changing default passwords and validating firewall access. Or -- you can get started the easy way with the Switchmate home smart light switch. There's literally no installation, no need to re-wire the light fixture. Instead, simply place the Switchmate over your existing light switch, and it attaches magnetically to the existing screws. There's no tools, no wires, no fuss at all. The Switchmate then has a motorized slider that can flick the switch on and off, which you can control wirelessly from your smartphone over Bluetooth. Using the Switchmate app (iOS or Android), you then can control the lights remotely, including having them turn on automatically as you enter the room, and setting timers for it to turn on and off, whether you are at home or away. This is a clever approach to getting started with smart home automation. It works well -- the magnets are strong enough to keep the Switchmate securely in place, and you can still flick the switch manually. It runs on two AA batteries that should last up to one year. 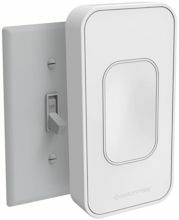 The Switchmate home smart light switch is available for $39.99, in white and ivory to match your decor, and with models for either toggle (standard) or rocker switches. The Tile Bluetooth Tracker is a smart idea, nicely executed. 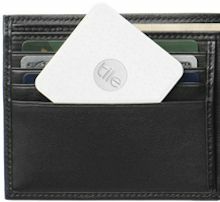 The Tile is a small device that you can attach to your keys or slip into your briefcase, so you can quickly find your stuff -- or your smartphone -- when they go missing. The basic Tile Mate product's design is quite small and light at 1.34 x 1.34 x 0.18 inches and 0.22 ounces (34 x 34 x 4.65 mm, 6.1 g). And it has a keyring hole to easily attach to keys, remotes, and backpacks. And now there's the new Tile Slim, with a larger profile but ridiculously flat, at 2.13 x 2.13 x 0.09 inches and 0.33 ounces (54 x 54 x 2.4 mm, 9.3 g). It's as thin as two credit cards, so you can slip it in your wallet or attach it to the surface of your laptop. - You can use the Smartphone app (iOS or Android) to Ring the Tile -- it will then play a loud tune so you can find your things. - Or you can double-press the button on the Tile to Ring Your Phone, so you can find it even when it is silenced. If you leave a Tile behind, you can use Last Place Seen in the app to view its last location on a map to go back and find it. And if you lose a Tile, you can set Notify When Found, and have the whole Tile community look for it -- You will receive an alert if anyone else running the Tile app comes near it. You also can easily share stuff tagged with Tiles. And you also can connect the Tile app across multiple devices, to ring one from another. The Tile app on your smartphone also is accessible from the Tile website. After you log in, you can see the location of your phone, ring your phone remotely, and set a lock-screen message for anyone who finds it. Tile uses Bluetooth Low Energy (BLE), so it has a range of 100 feet, but is most effective within a range of 30 feet. The Tiles are durable and water-resistant to the IP5 standard. The Tile's battery runs for about a year, and is not rechargeable. Tile then offers a reTile program to replace and upgrade your Tile, currently at 50% off. You also can send back your old Tile for recycling. The Tile Mate is available for $25 each, or $70 for a 4-pack, and the Tile Slim is available for $30 each, or $100 for a 4-pack. Entries posted to Manifest Tech Blog in November 2016, listed from oldest to newest.